For readers who loved GRACELING and THE HUNGER GAMES comes a startling new world and a breathtaking, unforgettable love. Exiled from her comfortable home, Aria knows her chances of surviving in the outer wasteland - called the Death Shop - are slim. Violent energy storms scan strike suddenly, and even the very air she breathes might kill her. Then Aria meets an Outsider named Perry. He's wild, dangerous - a savage. He's also her only hope. Because Aria alone holds the key to his redemption. Perry needs her, too. Their unlikely alliance will determine the fate of all who live under the never sky. Under the Never Sky is right up there on my list of favorite dystopians with Shatter Me and Dearly, Departed. That's not to say that it's exactly the same, but rather that I was surprised by how much I enjoyed these stories and characters and can't wait to read more! Aria is a bit naive, but that's to be expected from a character who has been sheltered from anything real for her entire life. Her background shows through from time to time, but she eventually proves to be incredibly adaptable, which was a trait I found admirable. Perry was unexpectedly likable, too. This probably came from his viewpoint. FYI: Each chapter is labeled with the name of the character who is narrating it. This makes for very easy transitions. The Aether storms were a very interesting phenomenon, and I hope to read more about them in the next book. It sounds crazy that something could completely ruin the landscape, but Rossi's descriptions show just how devastating they can be in this world and provide a good explanation as to why Aria's ancestors found it necessary to lock themselves into pods like Reverie. I loved the paranormal elements in this story. It can be tough to find a dystopian that is paranormal instead of tech-y (like The Hunger Games). I always love stories that involve genetic modifications, environmental or otherwise. Rossi is great at plot and character development. 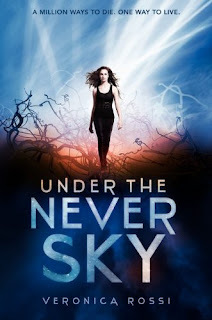 Under the Never Sky is a must-read!